Health and safety instruction by the new cairn. Photo by Andy Harrison. 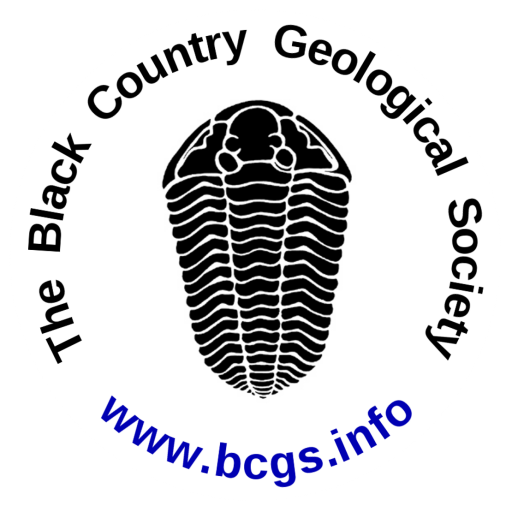 This was a return visit for BCGS members under the guidance of Paul Stephenson from the Birmingham and Black Country Wildlife Trust. 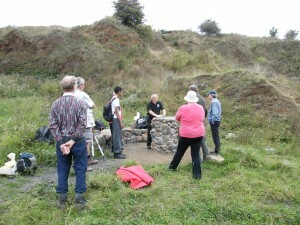 The day was rather cloudy, grey and breezy, when we met at the usual spot, off St Brades Close for 10:30. The summer’s vegetation, especially the bramble, had rapidly regrown over the area we had cleared the previous February. Paul spoke of the on-going battle to keep the bramble clear. Not only does it obscure the geology, but it also prevents the growth of important plant and wild flower species that have come to colonise the site. The wealth of these seen at Portway Hill Quarry does not necessarily appear to correlate with the underlying geology. Instead, it probably results from the variety of materials (i.e. blast furnace slag and colliery spoil, that have been used to infill the quarry) and the topography left behind from human activities. This visit was also our first opportunity to see the monument cairn and seat built of dolerite cobbles and boulders from across the site, which was completed in February 2014. Unfortunately the metal plaque on the top of the cairn had already fallen victim to the work of local vandals.